I’ve been anticipating the release of Bioshock Infinite for quite some time. Often when I place such high regards on a game, I’m disappointed. It’s not necessarily the games fault either but rather the unrealistic bar I set for it. Bioshock Infinite arrived in my life shortly after midnight on Tuesday March 26. The next 48 hours would be filled with sleep deprivation and obsession. Seriously, I played Bioshock Infinite every chance I could and when I wasn’t playing, it’s all I could think about. Even upon completing my first play through my mind has been swimming with thoughts of what I experienced in Bioshock Infinite. I recently started my second playthrough. I often play games more than once, rarely immediately after completing it for the first time. Bioshock Infinite is darn near perfect. A bold statement I know but I’d even go as far as saying it just might be the best game I’ve ever played. I’m haunted by events that took place in Bioshock Infinite. The game takes place in a fictional 1912 but presents the player with social commentary that could be applied to present day events. It’s also worth mentioning that the poignant story is not presented with a heavy hand. If you game for the sole purpose of escapism, Bioshock Infinite also has much to offer in the ways of fun gameplay, gorgeous graphics and intriguing characters. The heart of the story is the relationship between Booker and Elizabeth. Both characters will go down as some of the most memorable gaming has to offer. The fact that Elizabeth is non-playable never deters from her charm. And for once the tag along NPC character you must look after, isn’t a thorn in your side. In fact at times Elizabeth is downright useful and never gets in the way. It’s difficult to fully discuss the events of Bioshock Infinite without being spoilerific, so I won’t even try. I think it would be a crime having this game spoiled in even the slightest. I implore every player of this game to stop and think about the ending before judging it. I myself played the last part which is largely cutscenes a few times before I was fully able to process what just happened. Hidden clues are found amongst the voxophone recordings as well as the sightseers that are scattered around Columbia. Speaking of Columbia, it’s easily one of the most beautiful worlds to ever grace gaming. For all its beauty and lightness, Columbia masks an underlying darkness of racism and civil war. At the forefront of this hatred and exceptionalism, is the self-proclaimed prophet, Zachary Comstock, Infinite’s answer to Andrew Ryan. Fans of the Bioshock series will be familiar with the gameplay but I found it a little less challenging than the previous two endeavors and would suggest playing the game one level of difficulty higher. Finishing the game will unlock the 1999 mode which is an increasingly tougher mode with limited ammo and stronger enemies plus respawning will cost you $100. Should you not have enough money to pay the toll, you are sent back to the main menu. It’s kind of bittersweet that the current generation of consoles is being ushered out by the masterpiece that is Bioshock Infinite, considering Bioshock helped kick it off. Kudos to you Ken Levine and Irrational Games. 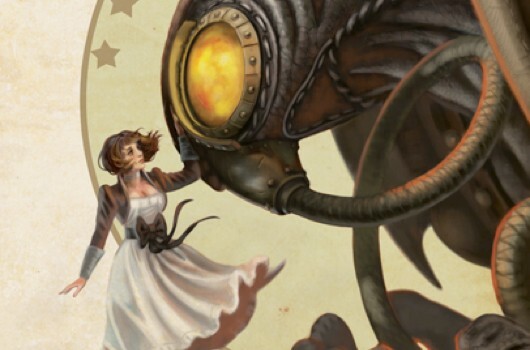 Bioshock Infinite just set a new standard in the world of games.